The quarter dollar was authorized under the Mint Act of 1792, yet this denomination was produced only sporadically until 1818. The large number of Spanish colonial two-reales pieces in circulation met the demand for coins valued at twenty-five cents, and there wasn't much need for additional USA quarter dollars until the revolutions that cost Spain her New World colonies interrupted their minting activities. In fact, it wasn't until the 1830s that significant numbers of the United States issue were produced, and this increase coincided with an update in minting technology. The close collar, which imparted a coin's edge device simultaneously with the striking of its obverse and reverse, was first employed by the U. S. Mint in the 1820s. When it was adapted to the quarter dollar in 1831, Chief Engraver William Kneass took this opportunity to modify the quarter's existing design. The result was a Capped Bust Quarter Dollar of greater thickness and smaller diameter. 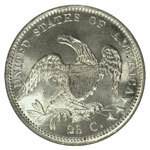 Coins of this modified design were produced through 1838, that year being transitional with the Seated Liberty type. 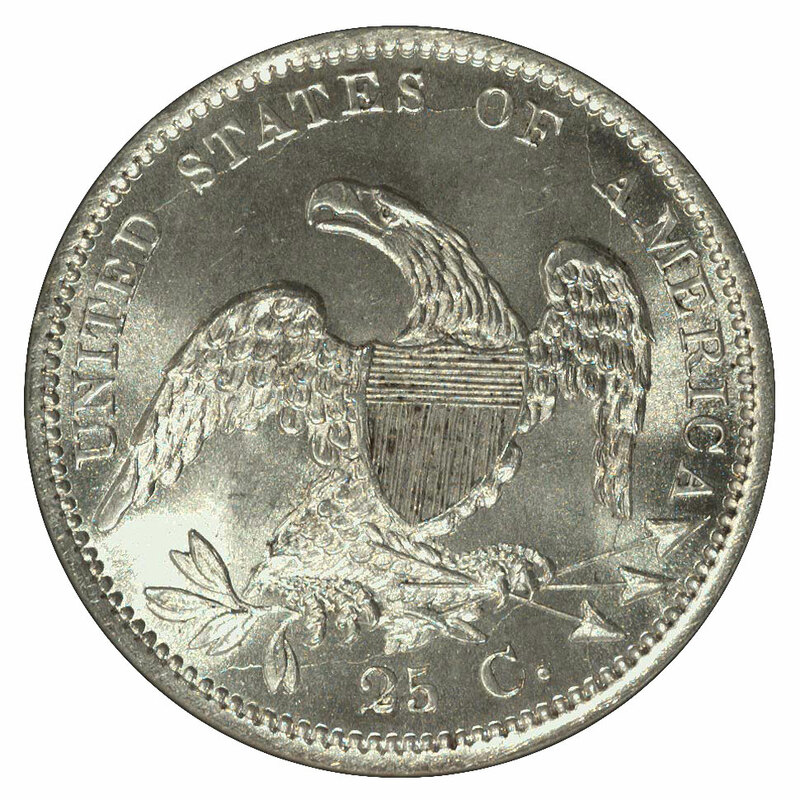 Because the close collar restricted the outward flow of metal at the moment of striking, the smaller size coins were more uniformly well struck than their predecessors. Still, some elements of the design may be found incomplete. The hair curl above Liberty's brow, the brooch that secures her gown and the stars surrounding her portrait may be less than fully struck. Usually, however, this weakness is not severe enough to have an impact on a coin's grade. The published grading guides are thus quite adequate for grading worn examples. There are enough uncirculated examples of the Small Size Capped Bust quarter that the advanced type collector should have no difficulty in securing one. The dates most often found in mint state are 1831 and 1834, though both are quite scarce in gem (MS-65 or higher) condition. Persons attempting to collect the entire series uncirculated will encounter some scarce issues. 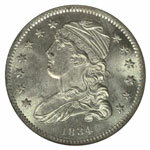 1832 and 1836 stand out as the dates least often available in mint state condition. The date collector will probably need to focus on circulated coins, as these are more affordable and more likely to be found. While there are scarce varieties within each date, this series doesn't seem to have attracted many variety specialists. With new books on this series already in print or awaiting publication in the next year or two, interest in varieties is certain to grow. Whether one is seeking mint state or circulated coins of this type there are certain factors to keep in mind. As noted above, striking sharpness is not a problem. Extreme die erosion is also seldom an issue with these coins, since the dies seem to have cracked and shattered before they became very worn. While such damage to the dies should have little impact on grading, some collectors may find them to be a distraction that takes away from the coin's aesthetic value. It is more what happened to these coins after they were struck that provides a challenge to finding nice examples. The relief elements on these coins are as deep as the rims and thus received little protection from impact with other coins; nicks and scratches are not at all unusual. Like most early United States coins, Small Size Capped Bust quarters were subject to clumsy and inappropriate cleaning by past generations, and the pool of unimpaired pieces is relatively small today. While the type collector will want to hold out for a problem-free coin having original surfaces, the date and variety collector may have to compromise a bit. The 1830s was a time of great experimentation at the U. S. Mint. Particularly observant collectors will notice that both the diameter and the reeding gauge (the number of reeds on a coin's edge) varied during the course of this series. While these differences aren't easily noticed unless the coins are placed one atop the other, they serve as a reminder that all United States coins have three sides. Enjoy the article? Use the bookmark tool to save or share it.